Based in Washington, DC, award-winning editor Barbara Conn has been writing about science, technology, small business, and general interest topics since 1984. Her articles have appeared in the Capital PC User Group “Monitor.” She earned a Bachelor of Science degree in chemistry from Bucknell University. When you're ready to work up a sweat in a competitive game of basketball with your friends, the first order of business is finding a ball to use. At a distance, outdoor and indoor basketballs look the same, but each style of ball has a specific design and purpose. By using the correct ball for your venue, you'll be able to play with that lone ball for years to come. 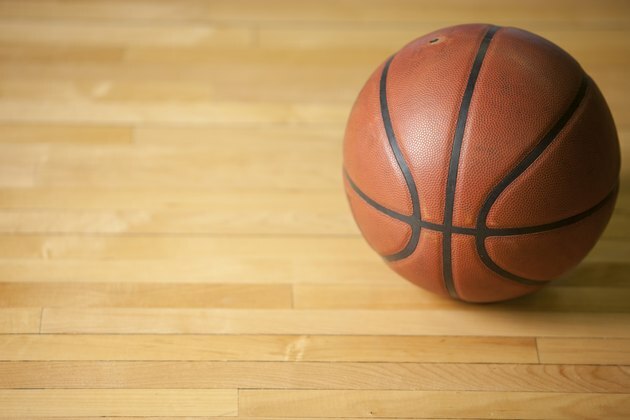 Indoor basketballs, including NBA and WNBA game balls, are made of full-grain leather. An official NBA game ball often feels slick and heavy right out of the box. Before you use it for a game, it often requires a significant amount of breaking in through dribbling and shooting. Basketballs for outdoor or “street” play are made of rubber and are ready to use immediately. Quality leather basketballs for indoor use have 122 pebbles per square inch, or approximately 35,000 pebbles over the entire surface of the ball. Rubber basketballs for outdoor use have fewer pebbles and feel rougher to the touch. Even covered with sweat, properly broken-in official leather game balls for indoor use are not slippery. Their ball handling characteristics are superior to those of rubber basketballs. Using an indoor leather basketball on an outdoor surface causes immediate wear and reduces the life span of the basketball. If you use your indoor and outdoor basketballs only on the proper surfaces, they should each last for several years, especially if you keep them properly inflated and clean them as needed. As of 2010, the price of the basketball standard for indoor use, the official NBA game ball, is $89.99. The price of a common ball for outdoor use, the NBA Street Basketball, is $17.62. If you won’t be using an indoor court for your basketball activities, save money by purchasing an outdoor rubber basketball rather than an official NBA or WNBA leather game ball designed for indoor use. Using indoor balls outdoors causes them to wear out quickly. To maximize the life span of your expensive indoor leather basketballs, do not use them outdoors in either game or casual settings. Transport them to indoor game venues without bouncing and dribbling them on streets and sidewalks along the way.